Respected Clairvoyant, Empath & Psychic, Cindy Summer, will be here at Debonne Vineyards on May 17 for Readings! Cindy has been featured on Fox 8 many times as well as WKYC with insights on Dream Interpretation and Spirits. Cindy’s mission is to inspire the client to align with the Divine in order to transform into the inner Light that lives in us all. Join Cindy for a 15 or 30 minute session in our Signature Cellar at Debonné on Friday, May 17th for insight into your year ahead! General Readings ~ This is a slice in time. Whatever comes up is what you need to hear. It may be confirmation of something you know deep down. It may be direction. Perhaps it is an idea. Inspiration and hope comes from this type of reading. Prophetic information may surface. Past Life Readings ~ This is a unique way to tie in a past-life experience to the present. We have patterns and circumstances that repeat until we grasp certain life lessons. I still gasp at how accurate and applicable this is for healing in this life. Mediumship Readings ~ Friends and family on the other side can be a source of great comfort and direction, even if you weren’t close in life. Their job is to give guidance. Your job is to entertain their advice. Note: Appointments will fill from the start time on a first-come-first-served basis in the appropriate time increments. 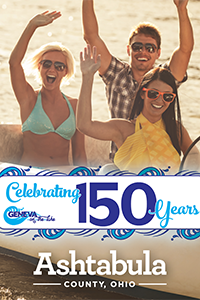 Each ticket purchase will be assigned the next available time-slot and will be emailed with the approximate time. 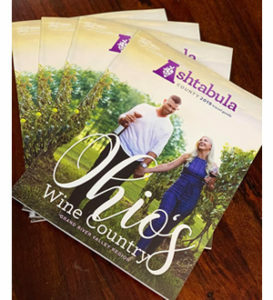 This entry was posted in and tagged Psychic, winery event. Bookmark the permalink. Join us on Tuesday, April 16th from 6-9pm for our monthly Wine & Psychic Night! Find out what your future holds and try a glass of specialty wine from Camelot Cellars! Click on the ticketing link to reserve your spot! Respected Clairvoyant, Empath & Psychic, Cindy Summer, will be here at Debonne Vineyards on February 22nd for Readings! Cindy has been featured on Fox 8 many times as well as WKYC with insights on Dream Interpretation and Spirits. Cindy’s mission is to inspire the client to align with the Divine in order to transform into the inner Light that lives in us all. Join Cindy for a 15 or 30 minute session in our Signature Cellar at Debonné on Friday, February 22nd for insight into your year ahead! This entry was posted in and tagged Psychic. Bookmark the permalink. 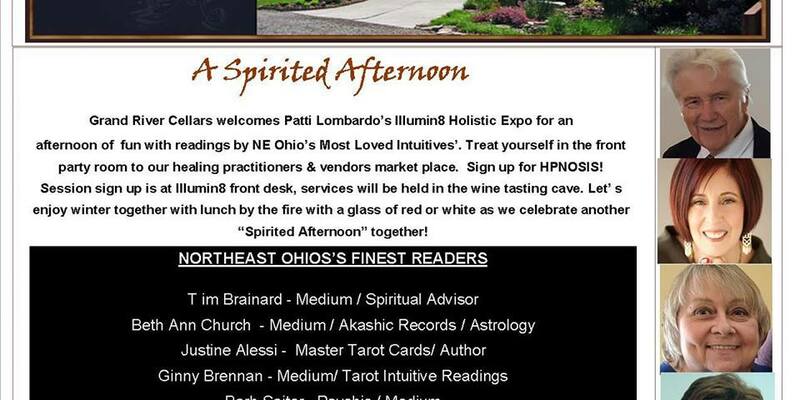 Grand River Cellar’s welcomes Patti Lombardo’s Illumin8 Holisitic Expo for an afternoon of fun with readings by NE Ohio’s most loved Intuitives. Healing practitioners & vendors will be on site along with Hypnosis sessions for becoming smoke free along with weifght management. Admission is free. All services are first come first serve basis and are paid for that day only. Readings cost $25 for 20 minutes and do sell out fast. Reservations for lunch or dinner are highly recommended. This entry was posted in and tagged #wine, Psychic, winery event. Bookmark the permalink. Join us on Tuesday, December 18th from 6-9pm for our monthly Wine & Psychic Night! Find out what your future holds and try a glass of specialty wine from Camelot Cellars! Click on the ticketing link to reserve your spot! This entry was posted in and tagged #wine, Camelot Cellars, Psychic, winery event. Bookmark the permalink. Join us on Tuesday, September 18th from 6-9pm for our monthly Wine & Psychic Night! Find out what your future holds and try a glass of specialty wine from Camelot Cellars! Click on the ticketing link to reserve your spot! Join us (Camelot Cellars) on Tuesday, August 21st from 6-9pm for our monthly Wine & Psychic Night! Find out what your future holds and try a glass of specialty wine from Camelot Cellars! Click on the ticketing link to reserve your spot! Join us (Camelot Cellars) on Tuesday, July 17th from 6-9pm for our monthly Wine & Psychic Night! Find out what your future holds and try a glass of specialty wine from Camelot Cellars! Click on the ticketing link to reserve your spot! 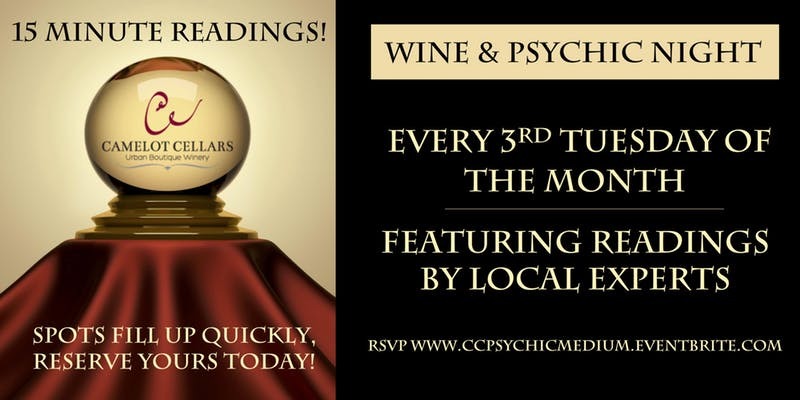 Join us (Camelot Cellars) on Tuesday, June 19th from 6-9pm for our monthly Wine & Psychic Night! Find out what your future holds and try a glass of specialty wine from Camelot Cellars! Click on the ticketing link to reserve your spot! This entry was posted in and tagged #wine, Psychic. Bookmark the permalink.